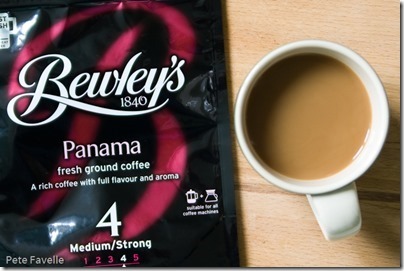 Bewley’s are an Irish company who have been operating for four generations. They started out importing tea, but soon added coffee to their repertoire. Bord Bia have been kind enough to send Pete Drinks some of their range to sample. This is Panama, a strength 4 coffee grown on the slopes of the Baru volcano. I’m not sure I’ve ever had a coffee from Panama, so it will be interesting to see what it’s like. The grounds are quite dark, with a rich fruity aroma of dark berries, a hint of tobacco smoke and an undercurrent of bitter dark chocolate. 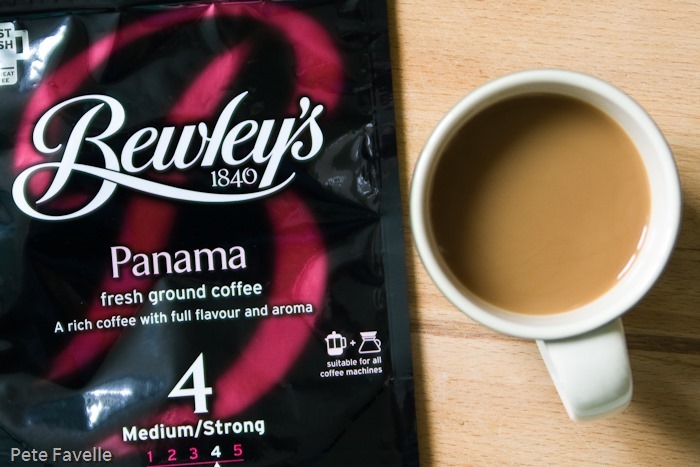 Brewed, it’s more of the same – a rich, fruity aroma with some tobacco and very little sweetness. It’s a decent coffee in the mouth; rich and darkly roasted, with some fairly deep bitterness coming through the subtle dark fruits. I find it a touch unbalanced, lacking the sweetness that it needs to hold the bitterness in check – it is perhaps more deeply roasted than my tastebuds prefer. Overall it’s a tasty cup, but it’s not setting my world alight and earns 2.5 stars.